Photo of the Rosetta Trio with Liberty Ellman, Stephan Crump, and Jamie Fox by Nathan James Leatherman. Starting off their spring concert series, Earshot Jazz is pleased to present Brooklyn bassist Stephan Crump and his Rosetta Trio on Saturday, March 2. Formed in 2005 as a response to the aftermath of 9/11, the Rosetta Trio has been exploring deeply personal themes of individual and collective experiences ever since. Many astute jazz listeners will recognize Crump from his long-standing collaboration with pianist Vijay Iyer. More recent, notable collaborators include alto saxophonist Steve Lehman, pianist James Carney, guitarist Mary Halvorson, drummer Tyshawn Sorey, and trumpeter Adam O’Farrill. Crump was born in Memphis, Tennessee and received early training in classical piano and alto saxophone before discovering the bass guitar at age 13. He spent his formative high school years playing rock and funk throughout the Memphis scene. Crump went on to receive a Bachelor of Music from Amherst College, studying under Lewis Spratlin and working with luminaries Max Roach, Frank Foster, and Ray Drummond. His appreciation for funk, groove, and folk (nurtured by his working relationship with his wife, folk singer Jen Chapin), continue to influence his music in surprising ways. Coming from a family of diverse artists, the agile bassist rejects the restrictions imposed by genre labels and perceived medium limitations. The Rosetta Trio has given Crump a platform over the last decade-plus to push his artistic creativity as a composer, to probe the personal and to create narrative within a sparse soundscape. 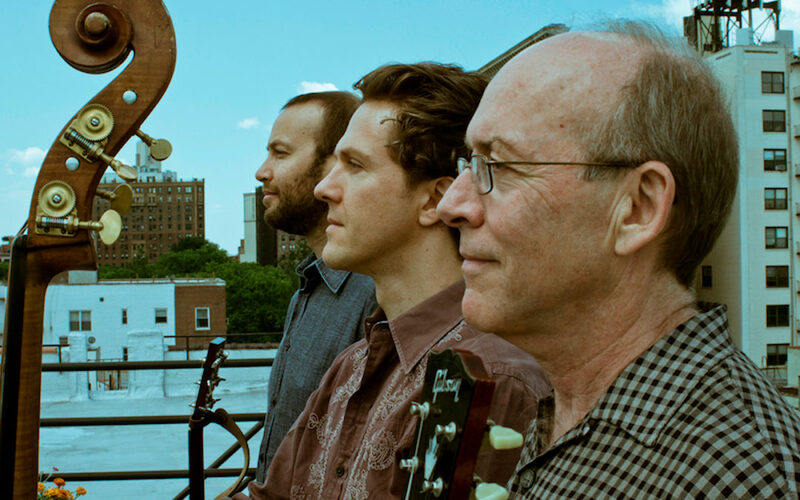 Led by Crump on acoustic bass, the trio is a “string ensemble for the new century” (Donald Elfman, All About Jazz), with Liberty Ellman on acoustic guitar and Jamie Fox on electric guitar. The lack of drums is unexpected, and the ensemble embraces the rhythmic flexibility and challenges it presents. The result is a sound that sits within the liminal space of jazz, avant-garde, and contemporary folk. The Trio’s eponymous 2006 release, Rosetta, was one of Crump’s earliest projects as a leader. The project began as an outlet for Crump to process the loss of loved ones in the wake of 9/11, to acknowledge the fragility of life by weaving intricate fragments into something beautiful, much like a rosetta. In short, to make sense from the senseless. Crump, Ellman, and Fox have a palpable synergy that lives beyond their first, sublime collection. The trio’s follow-up album, Reclamation (2010, Sunnyside Records), reaches further still into deeply personal themes of home (“Memphis”), government power (“Overreach”), land abuse (“Pernambuco”), and relationships with technology (“Here not here”).